Summer has truly come and gone and December here in New Brunswick has been one storm after another. Out of 5 Sundays we were able to get to town for church for 2. The Sunday before Christmas we got a big ice storm that knocked out our power from the afternoon of the 23rd until the afternoon of the 26th. We had a pioneer Christmas, keeping the wood stove going, bringing in wood, melting snow and ice on top of the stove to use for flushing toilets, washing dishes, and even "showers" on Christmas Eve. Thankfully the cold temps meant that we could empty our fridge and freezer into our shed and not lose too many groceries, and previous water issues meant we had lots in storage for drinking. Today (December 30th) we're finally getting around to having our (now thawed for the 2nd time) turkey dinner. It's been a good time to focus on family and the gifts that truly matter, and we've enjoyed lots of together time this holiday. We've also witnessed our community pulling together as neighbours checked on each other, homes were shared between those with and without power/generators to warm up, clean up, and just visit. The (Volunteer) Fire Department went door to door to check on people and provided water for people and animals as needed, as well as a warm place to shower and rest. There has been firewood and food donated, as well as bottled water and helping hands. It's been heartwarming in the truest sense. As the year comes to a close I'm thinking about choices for One Little Word, whether or not to make resolutions, health and wholeness goals...and I'm just very thankful for all that I have. The world is good; at least in my corner today. Happy Holidays, whatever holidays you celebrate. May the New Year hold beautiful blessings and bountiful joy for you and those you love. I'm going to try to do a year in review post, but just wanted to drop in and share my warmest wishes to friends and family. I leave you with a few photos from after the ice storm (Christmas Eve); it may have presented us with a number of challenges, but it was terribly beautiful! On Thursday last week we all went to the local pub for supper. It was my Mom and Step-Dad's anniversary and they treated us (a little backwards, but we'll take it!). After some delicious pub-grub we decided to go to the elementary school to walk off some calories while the kids played on the playground (visit 3 playgrounds is on our list!). We had a nice visit and were on our 5th or 6th lap when some friends arrived from the Home and School Committee to plant a memorial tree. Once the tree was planted they mentioned that they were heading to the lake next for a swim. My kids heard that and were AAAAAAAAAAALLLLLL over it! It was already bedtime so I wasn't sure, but they reminded me that we hadn't crossed off "swim in a lake" yet, so we dashed home for our suits and headed for the lake. Mom and Terry stuck around to watch and snap some photos of their own, staying mainly to the safety (from the bugs) of the car and the comforts of the newspaper and Sirius radio. The advantage to our way-past-our-bedtime swim was that we also got to cross "watch a sunset" off of our bucket list! I started worrying a bit about that anvil-shaped cloud blocking the sun, and sure enough, about 10 minutes after we pulled into our driveway the sky opened up and dumped a bunch of water on us. It was a heavy shower but only lasted about 10 minutes. All in all, a very good show. Thank you summer, for a magical night. We truly are having a #happyfamilysummer! On Saturday we crossed a big item off of our summer bucket list. We packed a picnic lunch, located the mp3 player, hopped in the car, and headed off to beautiful Saint Andrews by the Sea for a concert...and lots of other fun things. Our first stop was the Huntsman Marine Science Center (we have a membership). We arrived right on time for the morning seal feeding. It was so good to see Snorkel and Loki again and see what new tricks (ahem, behaviours) they had learned over the winter. and debated going down to the beach and doing a little beachcoming, but we knew our time was tight and we really wanted to get in to the touch pools, so we went in. Poor stars! He still managed to find a few though! Then it was time to head downstairs and see everything from an underwater perspective. ...and their friends are pretty cool too. Our local schools don't have any sort of an instrumental program. No band, no orchestra, not even a little recorder group. Since Hubby and I are band geeks missing our instruments, this pains us, and I really wanted the kids to have a chance to try out some instruments. The "zoo" did not disappoint. while the Princess gave clarinet a whirl (she didn't care for it). Eventually it was time to close up the "zoo" and settle in for the concert. We had a simple picnic lunch and settled in as close as we could. A little collage of the Sistema Orchestra. This orchestra has children aged 6-12 and they played beautifully. They started off with the William Tell Overture because they love it so much, and they ended with the 1812 overture. So fun and very impressive! We did so much more as well; once the concert ended we toured the entire garden and posed with all the statues for photos. We went for ice cream and ate it by the wharf, then walked all around the historic downtown. We went and played on the very awesome play structure and finally dragged our tired and sunburnt selves home. I have many more photos to share but this post is LOOOOONG so I'll save them for another post. We loved our day. Not sure how anything else on the bucket list can top it, but we'll sure have fun trying! Today was another sticky scorcher, though the clouds were moving in and out, warning of possible thunderstorms one second and revealing sunny skies the next. We wanted to cross something off of our bucket list, but we didn't want to go far from home and get caught in a storm. We decided to try to find our first waterfall (we have find 3 waterfalls on our list). One of the students in the Boy's class did his Triad Presentation on waterfalls and said that there was one quite near us. His directions were less than helpful though, and when I asked him for better ones he looked at me like I was stupid and repeated himself. Never try to get directions from an 8 year old! (To his credit though, his directions were to "go past King's Landing and it's just down the road a bit off Rte 2", and those were correct, they just weren't too precise.) I found a list of NB Waterfalls through my powers of Googlefu (and promptly pinned it so that we can find it again). It took some searching, but we found a listing that sounded promising, the one for Lower Joslin Falls, and we got ready for adventure. To get to the falls, you literally (no, really) park on the side of a major highway. Yay us! Here we've parked and we're ready to explore. Except the Boy says "We don't have to go UP, do we?" Setting off across the rocks. We agreed that this probably wasn't a spot we could get any of the grandparents through. They'll have to just enjoy the photos. We had to squeeze through a deer gate in the fence (I've secretly always wanted to do that!). I spy a river! Creek? A trillium! I almost cried. I haven't seen trilliums yet in this province but they used to be everywhere when I'd go walking in Ontario. I've been missing them. We hear the roar, we're on the correct side of the creek, and this is the "cliff". Could this be all there is? No! After a tricky walk along the cliff edge we could see the "upper" falls. Time to pick our way along and down the cliffs to see the "lower" falls as well. The full view of the falls. Worth the tricky footing! I found a new friend! The boy discovers that water on rocks SPLASHES. Hehehehe. Hubby gets as close as possible to give everyone a context for the height of the falls. He is exactly 6 feet tall. As it turns out, my kids have mountain goat DNA. They had a TON of fun hopping about on the wet rocks, while I tried not to turn into helicopter mom. No one wanted to leave. The bugs were bad, but the cold water felt SOOOO good. It was really tempting to "fall" in, but we managed to resist. We eventually convinced everyone to head out. One last look at the falls from the bottom. I'm calling this one and a half waterfalls because on the way home we stopped by "our" falls. They're a little set of rapids just down the road from us and we've always called them a waterfall. Somehow after our experience with the rush and roar of Upper Joslin though, we just don't think we can call them that any more. Sorry little water spill. Maybe some day you can grow to be big. We came home to puddles and wet roads, so apparently it rained while we were gone. We had a small thunderstorm move through once we were all settled, but the heat didn't break. It's not officially summer here yet; school isn't out until the end of June, but it sure FEELS like summer! 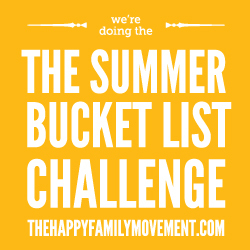 We're having so much fun with our summer activities and we're excited to pick something else off our list. Thanks #happyfamilysummer!